Product prices and availability are accurate as of 2019-04-24 16:33:38 EDT and are subject to change. Any price and availability information displayed on http://www.amazon.com/ at the time of purchase will apply to the purchase of this product. Our Natural Bamboo Toothbrush has BPA-free soft bristles, shaped to make sure your hard to reach areas are not a problem anymore! The handle is light and firm, made of natural bamboo so it is also water resistant and will last you as much as the cheap plastic ones! There is another perk...If you are familiar with Earth's Daughter, you undoubtedly already know that we do a lot to help others in need. We already donate a minimum of 5% of our profits to charity. The owners also donate many hours each year to helping others, including raising awareness of Human Rights and of their violations even in the great US of A. Stop searching and try us, add it to your cart now and you will not regret it! Did you know that most toothbrushes are made almost entirely of rubber and plastic, neither of which are biodegradable? They could take hundreds of years to break down. (Per sources on the internet, a plastic bag such as from the grocery store is estimated to take from 20 to 1000 years to decompose in our landfills!) Welcome to Earth's Daughter's Earth-Friendly Essentials! Our toothbrushes use the least plastic possible, while we have to use plastic for the bristles, we have chosen the safest and highest quality we can find - they are nylon and are BPA-free. Our handles are made from Bamboo. 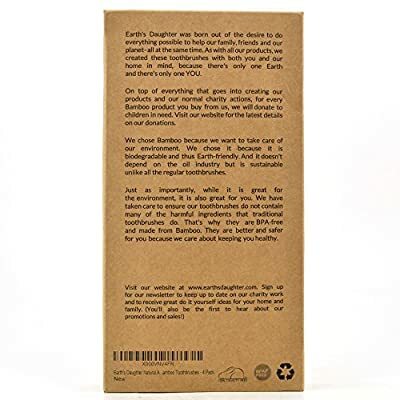 Our packaging is all plant based. 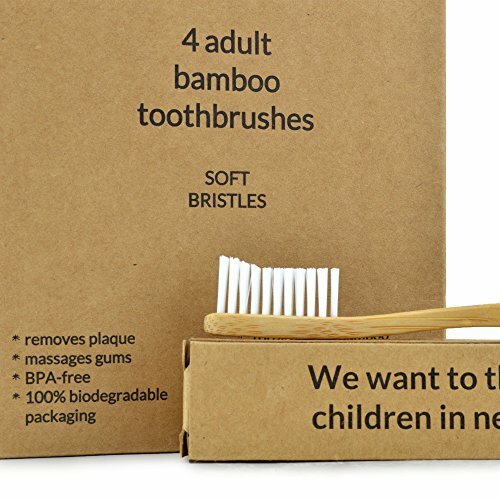 And because our toothbrushes are mainly from Bamboo, they are made from a renewable resource (did you know Bamboo is the fastest growing plant in the world, some species grow as much as 3 or 4 inches in a single day and there are others that grow even faster!). Yes, Earth's Daughter is more Earth-friendly and conscientious than your typical company. And we are working for a change in society. And we are proud of this fact! Now understand we don't want to just make Mother Earth happy. She's just part of the equation. Day in, day out, you stick plastics and rubbers in your mouth at least once or twice a day. These are the by-products of oil. I can't imagine that would be too great for you, ever thought about that? (If you've ever put a new toothbrush in your mouth without toothpaste, I'm sure you have tasted that horrible plastic/rubber taste!) The leading brands for toothbrushes today are concerned about the style of their brushes and who has the latest "technology" for brushing teeth or who has the coolest cartoon characters for the kids. We want to go a step further and while giving the best and cleanest brush possible, we don't want you putting your health on the line while doing it. We want you using something in your mouth that will give you the most benefit possible. Our bristles are designed to clean as effectively as any manual toothbrush out there. Let's face it. If you brush properly, the shape of the bristles and all the other gimmicks really don't matter so much. Going to the dentist periodically and getting a cleaning will also help. However, we do have some tech to our bristles. The longer bristles on the end of the brush allow you to get behind those hard to reach back teeth and between your teeth better than just a flat brush. So our toothbrushes will more effectively clean your teeth than many of the toothbrushes out there and do at least as good a job as any of the others. We use soft bristles because they are gentler on your enamel and gums. Thus promoting a healthier mouth where your teeth will last longer. Our soft bristles also act to massage your gums while they clean. Our brushes are packed in separate packages to keep them sanitary, (not to mention they are much easier to get to than when enveloped in plastic with a thick paper backing). Our handles were also designed with your comfort in mind. They are easy to hold and manipulate in your mouth and minimize slippage for a safer and more comfortable brushing experience. Our brushes are made from the highest quality products possible, we have not cut corners anywhere. We have made every effort to make them affordable by offering 4 in a package. Packaging everything in an Earth-friendly way is not easy. It requires time and effort to do so. We feel that for our planet, it's worth it. We feel that for you, it is worth it. 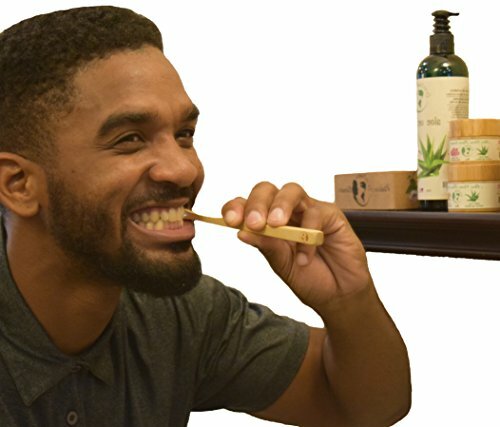 Ours are different than your traditional toothbrush but I am sure that once you try them, you will be happy with the results and what you are doing for the environment and won't want to use anything else again. So get yours now and support the evolution!